Building on the success of more than 130 years of USGS topographic mapping, the US Topo series is a new generation of maps of the American landscape. US Topo topographic maps are produced by the National Geospatial Program of the U.S. Geological Survey (USGS). The project was launched in late 2009, and the term “US Topo” refers specifically to quadrangle topographic maps published in 2009 and later. These maps are modeled on the familiar 7.5-minute quadrangle maps of the period 1947-1992, but are mass-produced from national GIS databases on a repeating cycle. US Topo maps repackage geographic information system (GIS) data in traditional map form; this benefits non-specialist map users, as well as applications that need traditional maps. 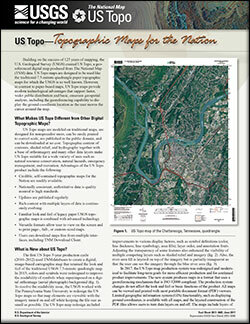 US Topo maps can be downloaded free of charge from several USGS websites. All maps can be viewed and printed with Adobe Reader or comparable PDF viewing software. Limited GIS functionality, such as displaying ground coordinates, is available with all maps, and the layered construction of the PDF files allows users to turn data layers on and off. The maps include layers not present on most traditional topographic maps, such as aerial photo and shaded relief images. Many additional feature classes have been added over the life of the project, and new and better data sources have been found for others. A challenge has been finding national datasets for all the feature types of a traditional topographic map. See this FAQ for more information about specific layers. US Topo maps are produced by the USGS National Geospatial Technical Operations Center. The first 3-year production cycle for the conterminous 48 states was completed in September 2012, and the second in September 2015. The third cycle is planned for completion in 2018. Hawaii, Puerto Rico, and US Virgin Islands also have US Topo coverage. Alaska has partial coverage, which is expected to be completed in 2022. Feature content is comparable to traditional maps, but with some significant additions and some omissions. Supporting themes for The National Map (TNM) include Transportation, Structures, Boundaries, Land Cover, Orthoimagery, and Small Scale datasets. Standards and specifications are essential to facilitate the development and sharing of geospatial data and products. The USGS standards and specifications define the requirements to ensure that all products and data prepared by the USGS under the National Geospatial Program are consistent in accuracy, structure, format, style, and content. 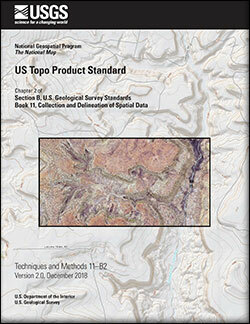 Fishburn, Kristin A.; Carswell, William J.
Fishburn, K.A., and Carswell, W.J., Jr., 2017, US Topo—Topographic maps for the Nation: U.S. Geological Survey Fact Sheet 2017–3045, 2 p., https://doi.org/10.3133/fs20173045.